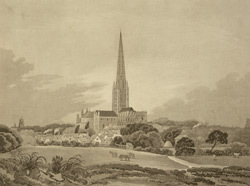 View of Norwich Cathedral from outside the city. According to Daniel Defoe, who visited in the 1720s, the cathedral "is a fine fabrick, and the spire steeple very high and beautiful". Indeed, the spire is the second highest in England and can be seen when approaching the city from any direction. The cathedral was established in the early 12th century (the Bishop's See, previously at Thetford, was moved to Norwich in 1094) and is a fairly complete example of a Romanesque cathedral.